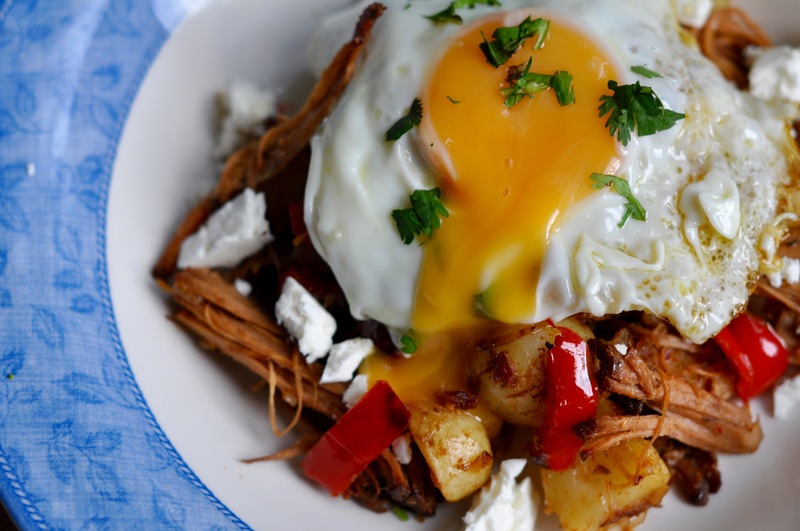 Nothing can go wrong when you use pulled pork in a dish. Nothing. And this is no exception. I wanted to use leftover pulled pork (which freezes really well, by the way) without making the usual sandwich with slaw on a brioche bun. I remembered my favourite breakfast in one of my favourite London breakfast places – The Breakfast Club in Hoxton. I always have the same and even though their menu is extensive I just can’t resist their Chorizo Hash Browns. 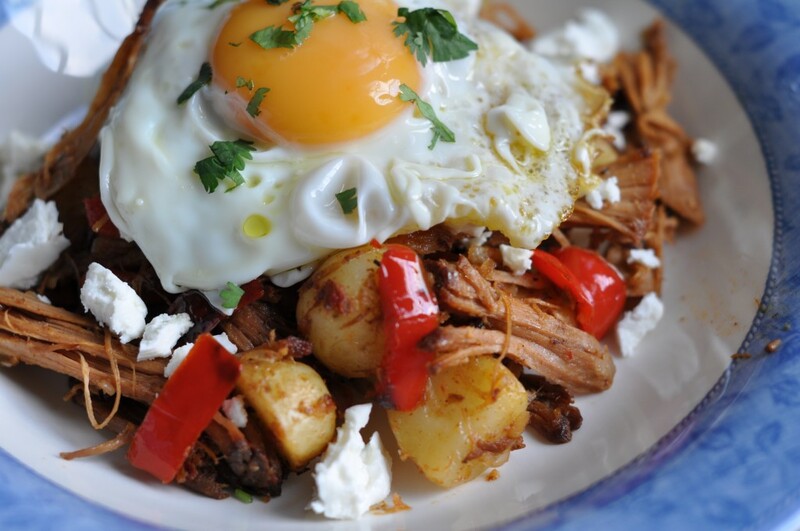 It’s a potato, onion and pepper ‘hash’ with chorizo, eggs on the side and feta as an optional extra. It really works! So I thought if I used pulled pork instead of chorizo it should still work. Oh and it worked. It really really worked. There is nothing hard about this recipe and it’s also quick to put together provided you have leftover pulled pork. And you can have it as a main or breakfast. Brunch anyone? You can find the original pulled pork recipe here. 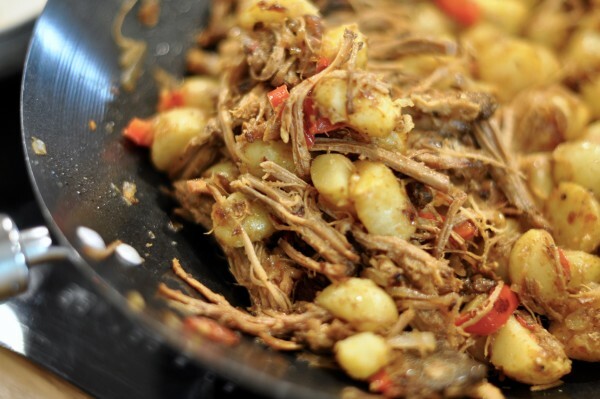 Want more slow cooked meat recipes? Check this slow roasted beef brisket. 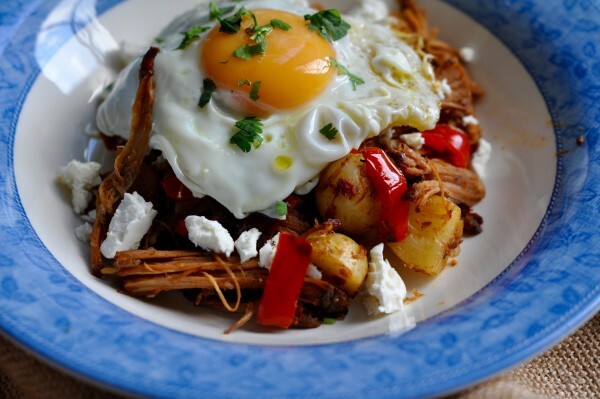 A delicious and easy way to use leftover pulled pork, cooking it with shallots, red peppers, baby new potatoes, feta cheese and a fried egg. 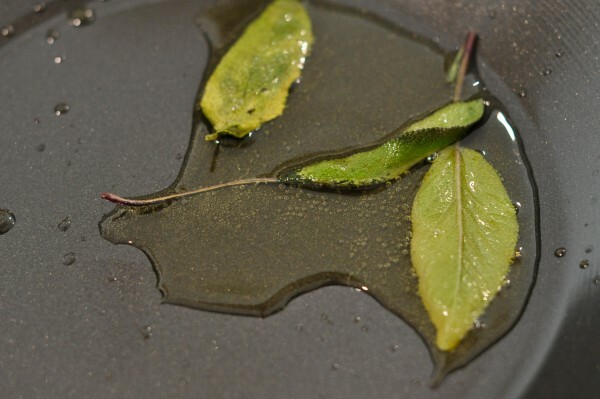 Heat the olive oil in a deep frying pan (I used a wok) and add the sage leaves. Let them fry for a couple of minutes. 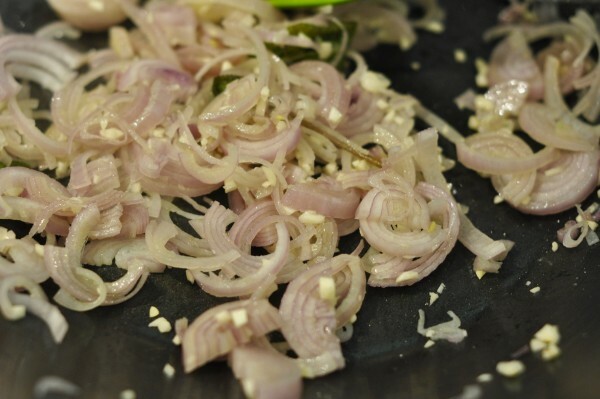 Chop the garlic finely, the shallots into fine slices and the pepper into 2cm strips. 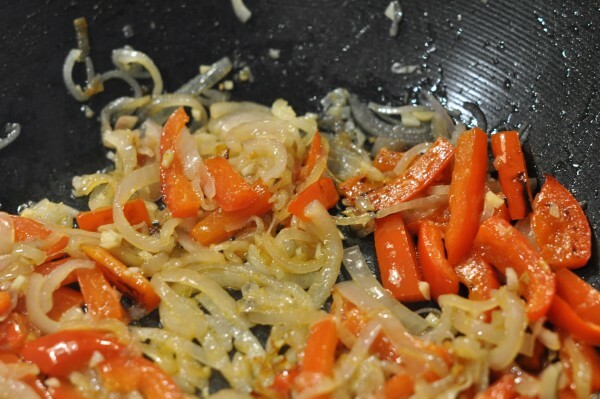 Reduce the heat to low and add both garlic and shallots to the pan. Let them soften for 5 minutes before adding the pepper. Cook for a good 15 minutes until the peppers are soft. In the meanwhile, chop the potatoes into small quarters or halves (depending on their size). You don't want anything bigger than a 1/2 inch cube. You don't have to peel them unless you want to. Boil the potatoes in salted water for 10 minutes or until they are soft. 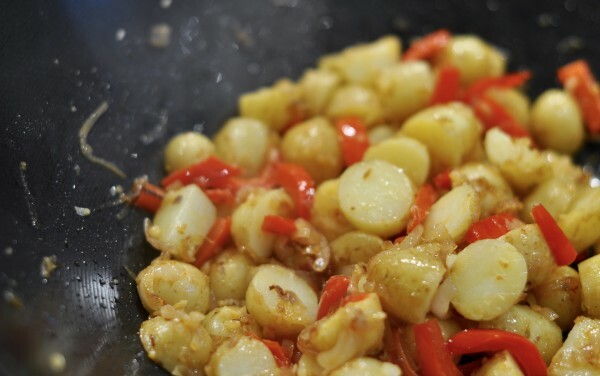 When the peppers are soft, add the boiled potatoes to the pan and mix well. Fry all the vegetables together for 5 to 10 minutes until the potatoes start to toast a little and the flavours have combined. Add the pulled pork and mix well, warming everything throughout. Add a pinch of black pepper. Fry an egg per person in olive oil. 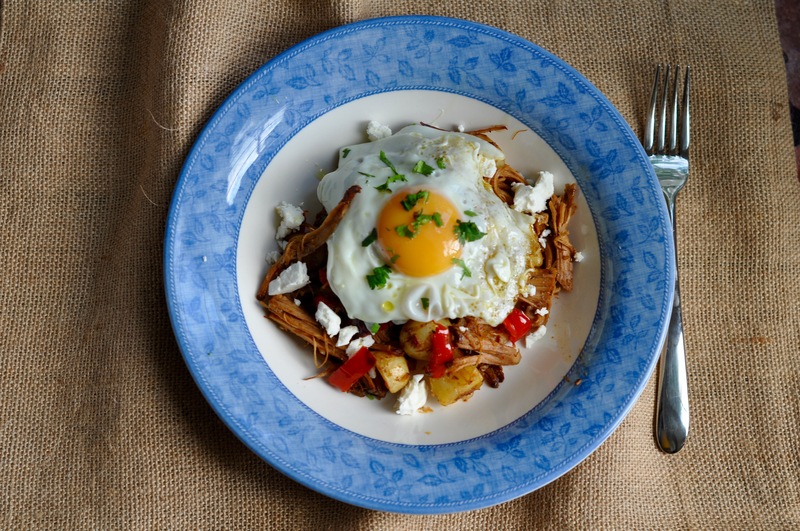 Plate up by crumbling the feta over the mix and placing a fried an egg on top. Finish with chopped parsley for a bit of colour. Thank you for dropping by and your lovely comments. Hopefully you can find other recipes that you might like. Let me know if you do. Hello, my name is Mariana and I am as passionate about food as one can be. 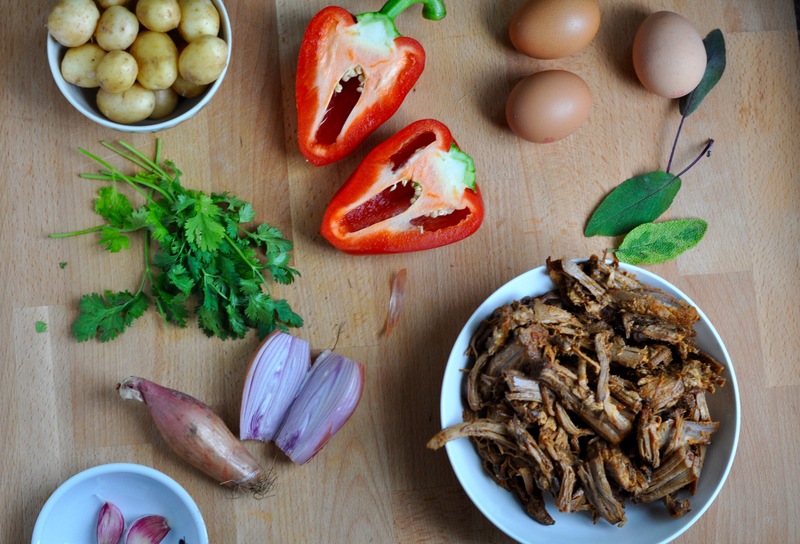 This is a very personal blog, designed to share recipes and experiences with food and food places. 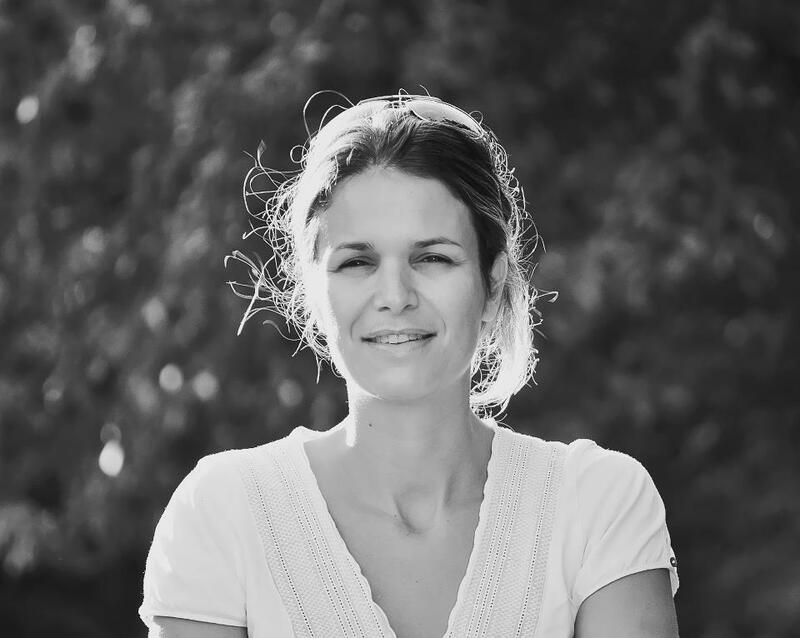 If you want to know a little more about me, visit the About section of this blog. I look forward to hearing from you. Happy eating!